Most people turn door handles every day and never even give a second thought to the parts of a door handle until they need or choose to replace part or all of the handle. If you're going to DIY your door hardware, it can be useful to know more about door handle components first. The parts of a door handle include knobs/levers, latch mechanisms, strike plates, boxes and keyaways. The most obviously noticeable part of the door handle is the knob or level that actually allows for the door to open. 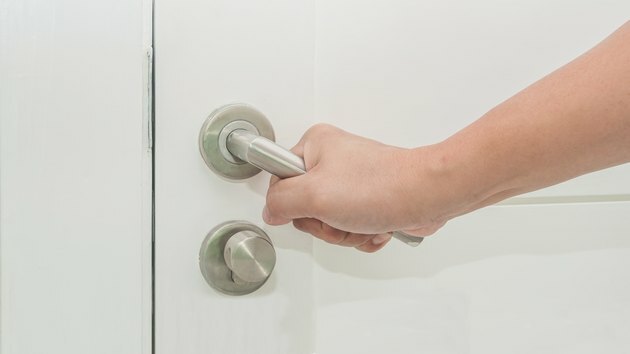 Knobs are generally round, although they may come in other shapes, and they open the door by turning, whereas levers (also called lever handles) open the door by pushing down. While it's pretty hard to install a door knob in the wrong direction, it's important to pay attention to the direction of a lever when installing one. While not the most important of door knob parts, a rosette is the plate behind the door handle or lever. While the rosettes in most homes are simple metal pieces, they can be elegantly detailed, and some door handles, particularly those with vintage designs, do not have a rosette at all. Perhaps the most important of all door handle parts is the latch mechanism. This is the spring-loaded piece that protrudes past the door, keeping the door closed. While most latch mechanisms use a retracting tubular latch mechanism that goes in when the handle is turned, some doors, like closets, use a ball latch. A ball latch does not retract when the handle is turned but instead is simply pushed open or closed in order to catch it on the specially indented strike plate. The latch itself is generally fitted to the door with a mortise plate, which provides additional security and makes installation more easy so the latch is properly situated in the door in order to catch on the door frame when the door is closed. Additionally, the mortise plate makes the latch mechanism look much more attractive than simply having a floating latch stick out the side of the door. When the door is pushed closed, the strike plate is the metal piece that the latch is pushed into on the door jam. The box is the hole where the latch fits in, which may or may not be fitted with a strike plate. Ball latches require a special, shallow strike plate, but most retracting tubular latches do not require a strike plate because they will still retract and go into the box when pushed against a door frame. That being said, strike plates make the door function more smoothly, look more attractive and protect the door frame from damage caused by repeatedly being pressed on by the latch. Not all door knobs have locks, but those that do contain a key cylinder through the middle known as the keyaway. These can have key holes on both sides or a turning mechanism on one side and a key hole on the other. Keyaways can be removed to rekey a door and even exchanged for matching sets so that multiple doors and locks can use the same key, although this will usually require all doors having the same brand of door knob lock since they cannot all be keyed alike. Most external door handles for homes feature spring bolts, which are attached to the latch mechanism and prevent the latch from being turned when the door is locked. Because they are spring loaded, the door can be closed while the door is locked. However, this also means these locks are easily picked, shimmied and even broken off with force, so most experts still recommend using a deadbolt when leaving your home. Deadbolts may be sold with a door handle or separately, but because the bolt slides directly into the box using a turning knob or a key, these are much more secure. Inside both door handle and deadbolt locks are spring-loaded pins, which are lifted by the uneven edges of the key, allowing the door to be unlocked when the pins move into their proper places.